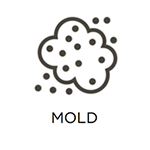 Mold can cause a variety of problems when it takes hold in residential and commercial buildings. It can cause property damage and poor indoor air quality, and lead to significant health complications in those exposed. 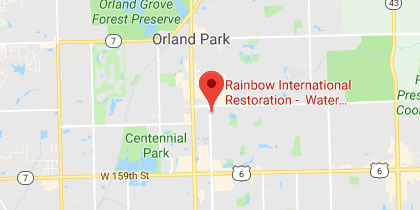 At Rainbow International Restoration of South & West Suburbs, we offer mold remediation services to property owners in Orland Park, IL, to tackle these issues. Through our services, we will fully remove mold from your property, and restore a safe and healthy environment. Our technicians at Rainbow International Restoration of South & West Suburbs have each passed a background check and they are highly trained to deal with mold situations. Once the mold removal process is complete, we will have a third party test your property to ensure that the mold spore count has been reduced. We guarantee that your property will pass this clearance testing after we finish the remediation. Your property is at risk of developing mold growth whenever excess moisture is present. 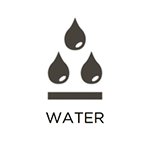 This makes it very important to monitor the moisture level in your home and keep it under control. Once mold takes hold, it can spread to other areas of your property, and cause discoloration, deterioration, and similar damage. 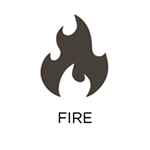 This can lead to structural damage in severe cases. If you do find mold growth in your home, you must not clean it yourself and instead call for assistance from an IICRC certified professional such as Rainbow International Restoration of South & West Suburbs. As the mold eats away at your building and personal items, its spores will travel through the air to cause additional problems. Not only can these spores take hold and grow in other areas, but they can lead to adverse health effects, as well. Allergic reactions, skin irritation, breathing troubles, asthma attacks, respiratory infections, and more are well-documented results of exposure to mold. Anyone can be affected by mold exposure, but the young and elderly are especially vulnerable due to weaker immune systems, and people with chronic allergies may experience worse symptoms. When you contact our representatives, we will send highly-trained technicians as quickly as possible to assess the levels of mold growth on your property and begin containment procedures. Our services end with a final clearance test performed by a third party to ensure that the mold level has been reduced. If you file an insurance claim for the mold damage, we provide direct billing to your insurance carrier to cover the claim. We perform an initial inspection in order to locate all areas affected by mold as well as the moisture source causing the mold to grow. We will suggest ways to correct the moisture issue and form a remediation plan once we have discovered to full extent of the mold growth. Mold will disperse its spores if it is disturbed in any way. We will contain the affected areas to prevent mold spores from spreading to other areas of the home or building. 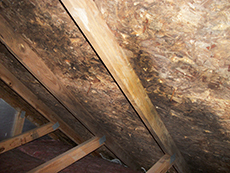 Removing the mold spores from the air is as important as removing the mold itself. We remove mold spores from the air with HEPA filters to help purify the air. 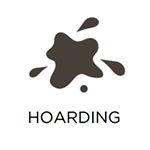 We dispose of any surfaces or materials that are too deeply damaged to be remediated. Simply covering up mold will only lead to future contaminations which is why these materials must be removed. We begin and end removal with thorough HEPA vacuuming to remove the mold spores from the air. 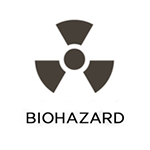 We have a third-party specialist come in to perform a clearance test once we have finished the remediation to make sure the spore count has been brought down to a safe level. We guarantee that your property will pass this clearance test. Time is of the essence whenever mold appears on your property. Through our mold remediation services, we will respond rapidly and create a step by step remediation plan to return your building to a safe and sanitary condition. We also offer a price match guarantee in which we will meet or beat competitive proposals that are in line with the IICRC’s standard of care. To leverage our mold removal expertise, contact our Rainbow International Restoration of South & West Suburbs representatives at (708) 571-2550. We are proud to assist property owners in Orland Park, IL.